I made a test batch of these to see if I should include them in my christmas cookie rotation. I’m happy to say they passed! The recipe is from One Smart Cookie, which is a collection of cookies, squares, brownies, etc, with less fat. I like the cookbook, but last year I tried making a couple of the recipes for christmas and I ended up dumping them in the trash. Of course, I was mostly to blame, because I made some modifications without testing out the original recipe first. Big mistake. 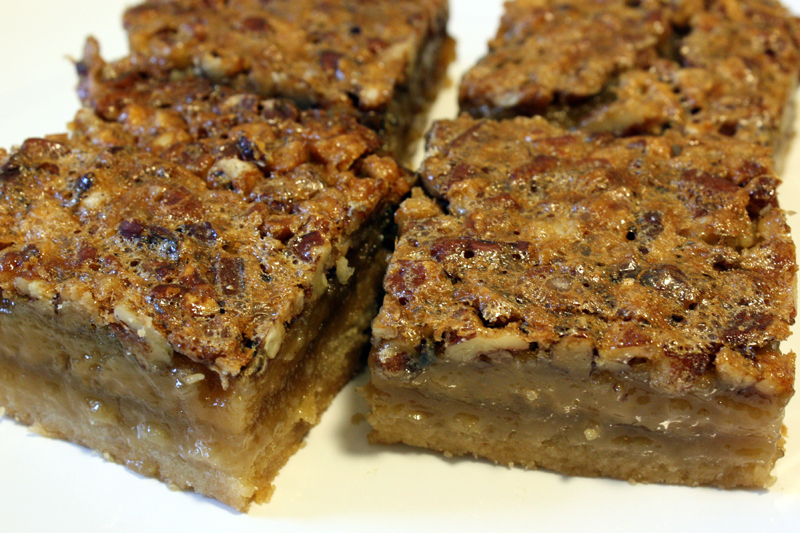 These are definitely not low-fat, but compared to regular pecan pie squares they are a slightly better alternative. I used chopped pecans instead of halves because when I went shopping for ingredients the pecan halves were sold out. I like them this way though. Preheat oven to 375°F and spray an 8″x8″ pan with cooking spray. In a medium bowl, beat butter and brown sugar until creamy. Add flour and salt and stir until well combined and crumbly. Press into the bottom of the pan. Bake for about 12 minutes, until just barely golden around the edges. In the same bowl (no need to wash it), combine egg, egg whites, brown sugar, corn syrup and vanilla and mix until smooth. Add flour and salt and stir until well blended. Arrange the pecans evenly over the crust and pour filling over top. Bake for 30-35 minutes, until puffed and golden. Cool in the pan on a wire rack.